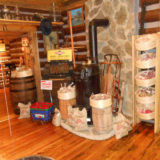 Step back in time to a REAL country store operating since 1954. Enjoy the color and aroma of fresh produce and flowers. Browse the selection of genuine country hams, old fashioned hoop cheese, jams & jellies, pies, apple butter, country butter, cured slab bacon, homemade sausages, Virginia apples, made-to-order Boar's Head sandwiches, and more! 6.5 mi. S of Lexington on US #11, OR 6.5 mi. N of Natural Bridge on US #11. OR TAKE: Exit 180/180B(Fancy Hill)off I-81 then take US #11 N for 2 mi.